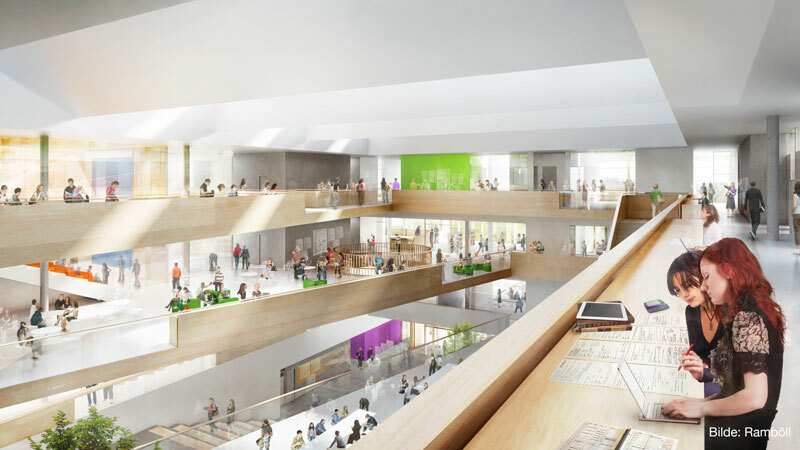 Skanska is currently building Norway’s first zero-energy school, Heimdal Gymnasium in Trondheim. IV Produkt has been awarded the prestigious assignment to supply the air handling unit to the project, which must be ready for the start of the new school year in August 2018. The school is designed to be a zero-energy building in accordance with the standard for passive buildings, which places high demands on suppliers. According to Eskil Solberg, ventilation project manager at Skanska, the ventilation is one of the key components in the project for achieving the lowest possible energy use. This puts SFP, annual efficiency and system division under the spotlight. Heimdal has therefore chosen to decentralise the ventilation, using 54 different ventilation systems positioned as close to the areas they serve as possible. “The concept is to use as little space as possible for technical installations, and the combination of small plantrooms and low SFP was the greatest technical challenge in the project,” says Eskil. The SFP target is one of the lowest ever in Norway. Eskil mentions that IV Produkt has displayed high technical competence and a genuine interest in achieving the project target. The supplied units have been adapted for the project and several solutions have demanded accurate calculations. The controls have also been tailored to the needs of the project. One step in quality assuring the units were arranging a test run by IV Produkt, which produced a result that was even better than predicted. The test showed that the fans have an SFP of 0.5 and a dry temperature efficiency of 85 % for the rotating heat recovery units.